Our residency on South Molton Street has come to a close, and we can't believe just how wonderful it has been making this space our own since November. With the rush of Christmas and the excitement of launching our In The Studio collection, we are so grateful to have shared our little shop with you. It has been amazing meeting so many of our lovely customers and introducing new faces to the brand, as well as holding events to bring everyone together and share our passion for Sundays. The run-up to Christmas was an exciting and busy time at the pop-up. We had just opened and were really enjoying the experience of having a real shop where customers could come in for a browse and a chat, and see and feel what D&D was all about. 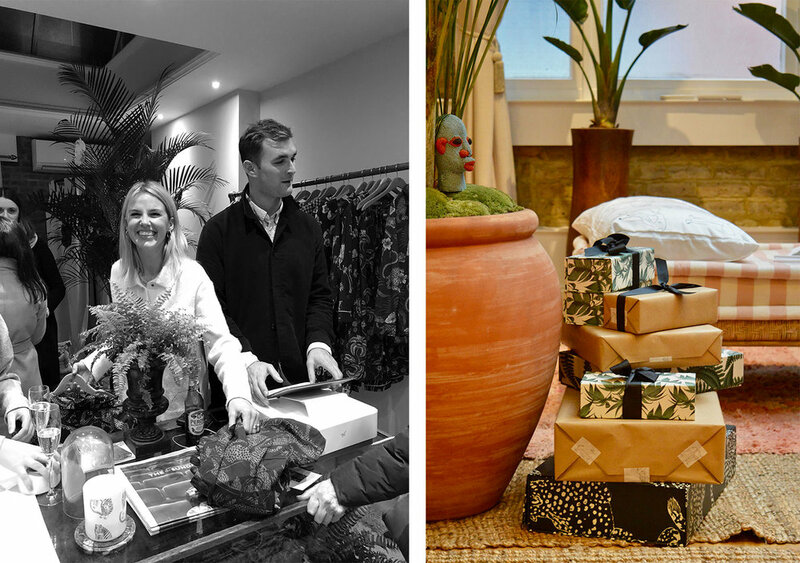 We had such a great time helping pick out the perfect Christmas presents, and getting to know so many of you at our customer launch party and late-night shopping with mulled wine and mince pies. After the Christmas rush was over, it was time for us to get started on our Year of Great Sleep and Big Dreams. 2019 is the year we focus on the importance of sleep and the impact it can have on our creative selves, our careers, and our happiness. To get things started, we hosted two events. The first, held on a full moon, was a Night with the Nymph of Neptune, who spent the evening explaining the moon cycles and what they mean for us as a collective, as well as how they can impact us personally. She taught us how to set intentions, to be disciplined in them, and to understand that when things aren’t going quite right there might be a bigger reason behind it all. The second event was Early Morning Nidra Yoga with Atelier 108, where the amazing Shereen Daver took us through a guided meditation, putting us into a dream state and then waking us to feel rested and ready for the day ahead. In early March, Molly and the team spent a whole Saturday re-painting, re-decorating and re-organising the shop for the launch of our SS19 In The Studio Collection. 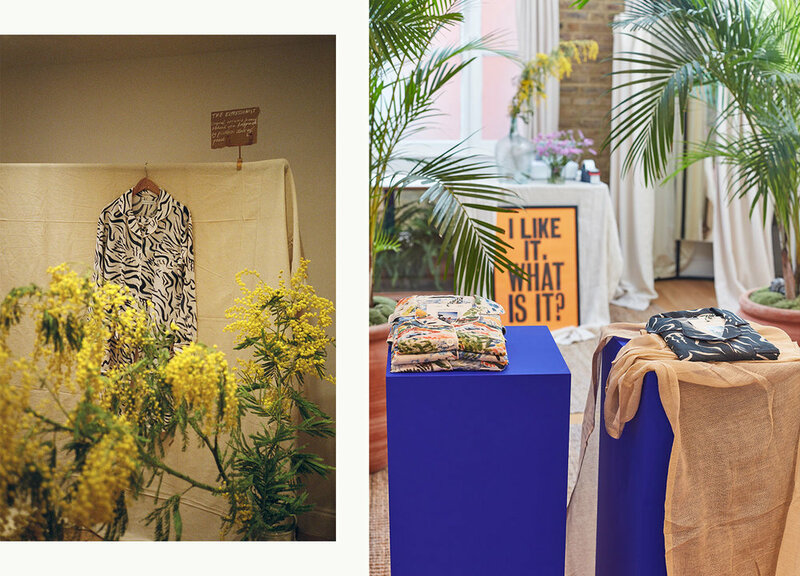 From what it had been in the run-up to Christmas, it was completely transformed to resemble an artist’s studio, with drop sheets covering the tables, our hand-painted prints hung up on the walls, and the bright colours of our new collection standing out from the rails. To run alongside our new collection, we launched our collaboration with artist Venetia Berry, who we had worked with to create a series of ten pyjamas embroidered with her signature line drawings depicting the female form. In celebration of this collaboration, we held two intimate life-drawing classes where Venetia taught us the basics of drawing the human body, as well as giving an introduction to her work and our collaboration together. We are so pleased to have been able to work with such a lovely person and wonderful artist. 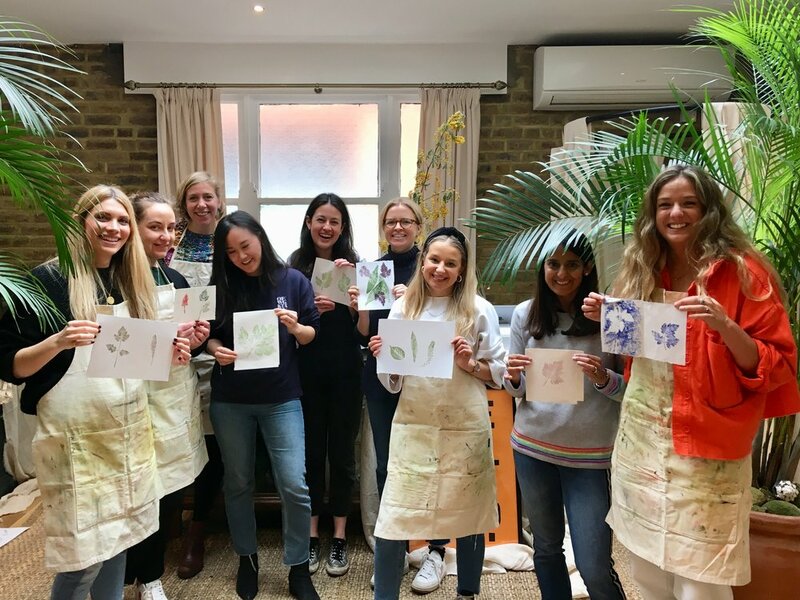 For our final pop-up event, we held a Nature Printing class with Pia Ostlund, who we worked with to create the Print Maker print from our In The Studio Collection. Pia is a specialist in this ancient lost art, and it was a pleasure to have her share her wealth of knowledge with us. It was a wonderful afternoon spent getting our hands covered in ink, and creating beautiful prints everyone was really proud of. Pia (third from left) and our lovely artists with their work at the end of the Nature Printing event. Before we go, we just want to say a very special thanks to the amazing Rosie from Motive Productions who we would not have been able to do this without. Her hard work, creativity, and ability to think on her feet have made this all possible and we can’t thank her enough. We’d also like to thank Francesca Gentilli for letting us use her beautiful vintage Moroccan rugs throughout the store, and Sophie from Kalinko Home for all the amazing Burmese homewares. Also, thank you to everyone who came to see us at the shop! It has been such a pleasure meeting so many of you, and we can’t wait to see you in the very near future at our next pop-up!